Just outside room 35 at the British Museum stands Grayson Perry’s highly decorated, Kenilworth AM1 motorbike on which sits a portable shrine to Alan Measles. Alan Measles is Perry’s teddy bear and, if you venture inside the exhibition, which I highly recommend you to, you will learn a lot more about him. The motorbike is a teaser that attracts those unfamiliar with artist’s work into the exhibition. I have long admired Perry’s ceramics and needed no encouragement but I don’t think many could walk past this extraordinary pink motorbike without wanting to know a little more. 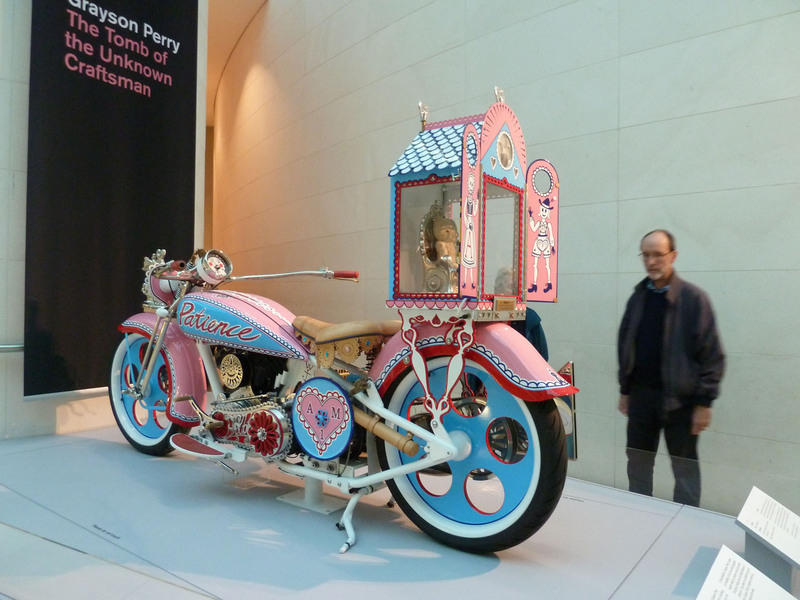 Grayson Perry’s extravagant motorbike. Own photograph. Grayson Perry is a quirky character if ever there was one – Turner Prize winner, transvestite, potter, teddy bear lover and husband. This is what most people know about Perry but he is so much more – he is a highly-skilled artist. Many critics debate whether Perry is a craftsman or an artist but this exhibition proves that he is both – the artistic integrity in Perry’s craft is unsurpassed. For Perry, the clay that he uses is his drawing board, this craft is his art. 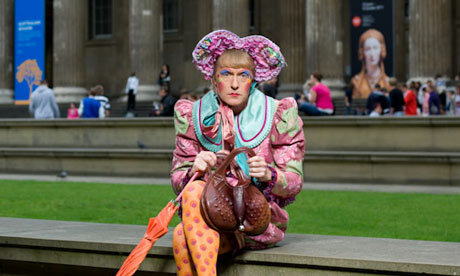 Grayson Perry as Claire at the British Museum. Image via www.guardian.co.uk. 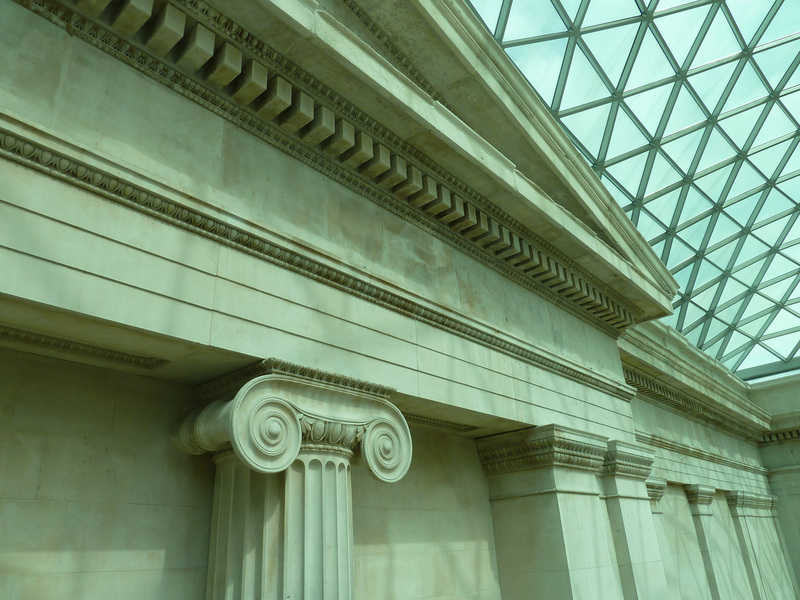 Perry first visited the British Museum at the age of six. 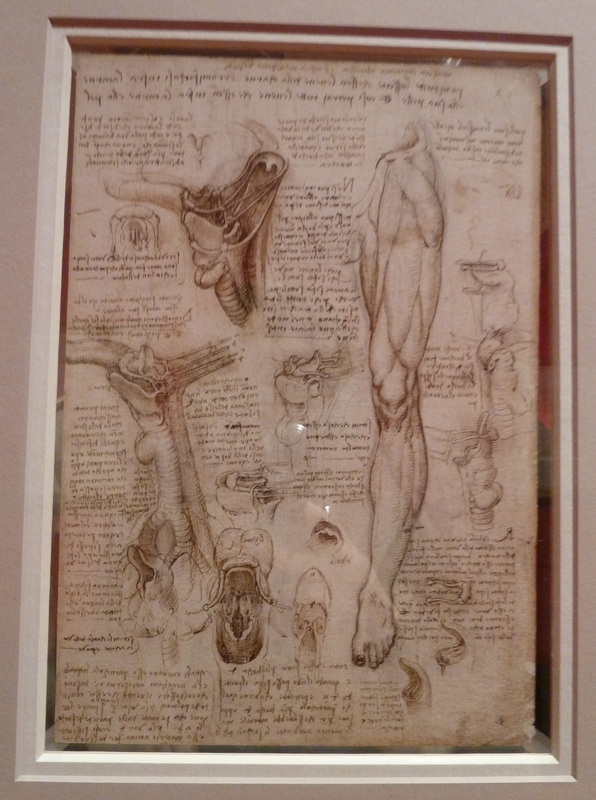 Hubristically, he explains that he wanted an exhibition there. 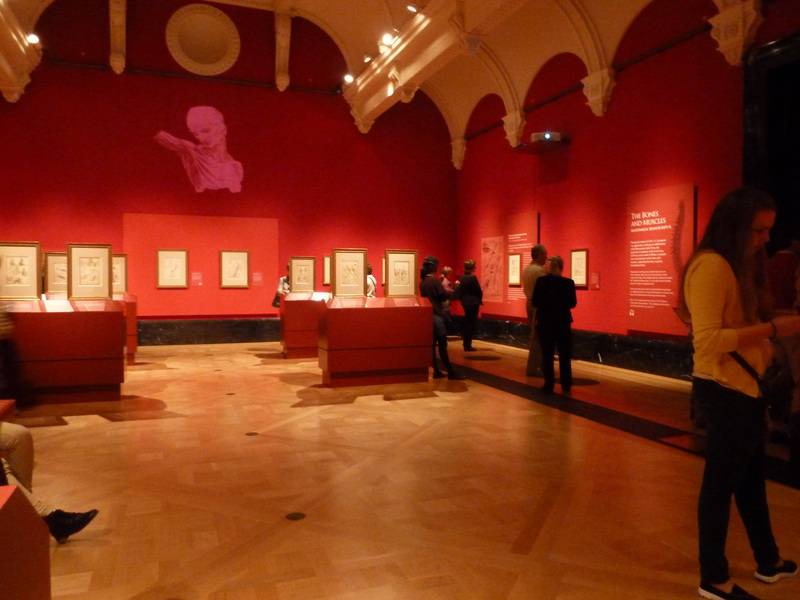 Whilst on this amazing high, Perry wrote a proposal to Neil MacGregor suggesting exhibiting works from his own ‘civilisation’ alongside those from the museum’s collection. The rest, as they say, is history! 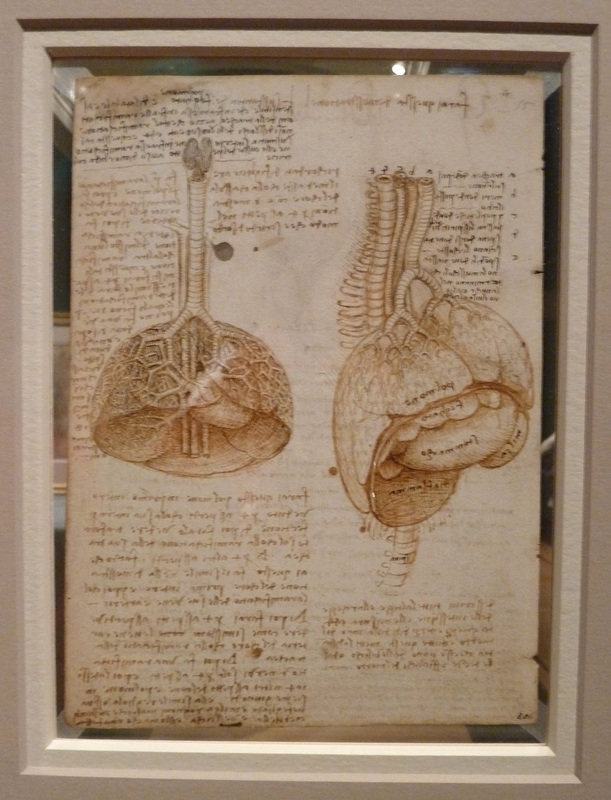 What a fantastic opportunity Perry had afforded himself – like a child in a sweetshop, he raided the BM’s collections and storerooms seeing what surprises they held. Perry is a decisive man but it can’t have been an easy task and his long-list had around 1,000 objects on it. Reversing the usual process of response, Perry picked works from the collections that connected to his own, already-made, works. Perry also used their online database which, although not as much fun as plundering the collections, is a very valuable tool (and one on which I was myself heavily reliant during my Masters, while looking at the Hussey sketchbooks). Grayson Perry, Our Mother, 2009. Image courtesy of the Artist and Victoria Miro Gallery and via www.britishmuseum.org. 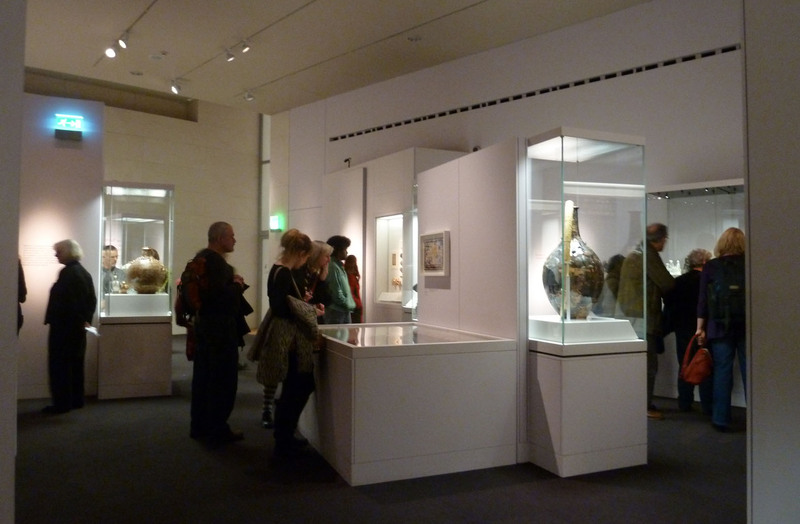 Through a series of juxtapositions, the exhibition offers the opportunity to view a collection of British Museum objects at three different levels: we would not normally see many of these items from the storerooms, we would certainly not see them together and, here, we can see them alongside some of Perry’s amazing pieces. This is a clever way to reassert the relevance of the British Museum’s holdings. Most of Perry’s works are focused around Alan Measles, Perry’s 50 year old teddy bear, a ‘living god in [his] personal cosmology’. Having Alan Measles as the leader of Perry’s special universe started as a personal joke but, as is so often the case, jokes progress and Perry began to consider how this imaginary framework could be a useful way to look at other cultures and religions. 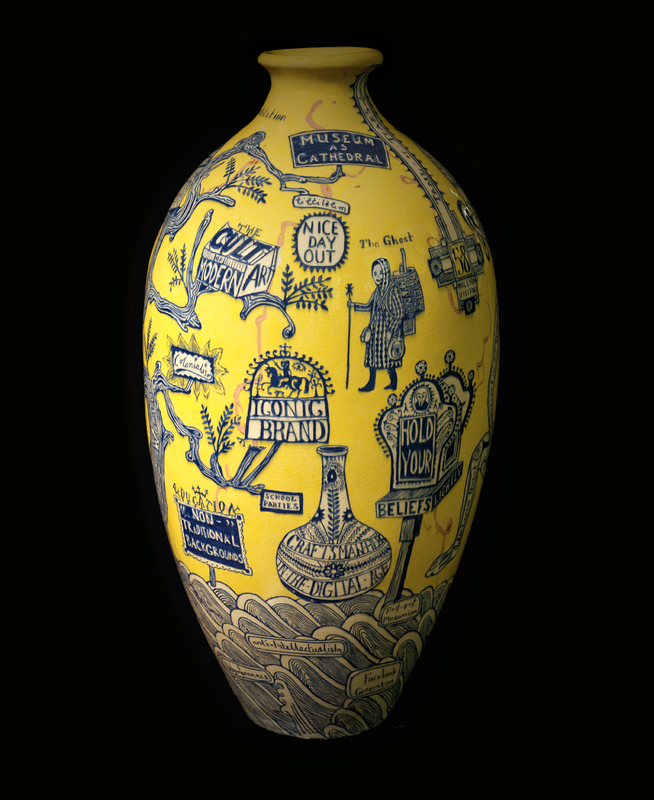 Grayson Perry, The Rosetta Vase, 2011. Image courtesy of the Artist and Victoria Miro Gallery and via www.britishmuseum.org. As well as including a selection of brilliant objects – both contemporary (Perry’s own works) and historic – this exhibition is so successful because of the curation. As Perry himself explains at the start of the exhibition, ‘I am not a historian, I am an artist.’ He has not approached this exhibition from an academic perspective. Rather, he has imagined what he would enjoy visiting. Lead-glazed earthenware dish decorated in coloured slip with the bust of William III. 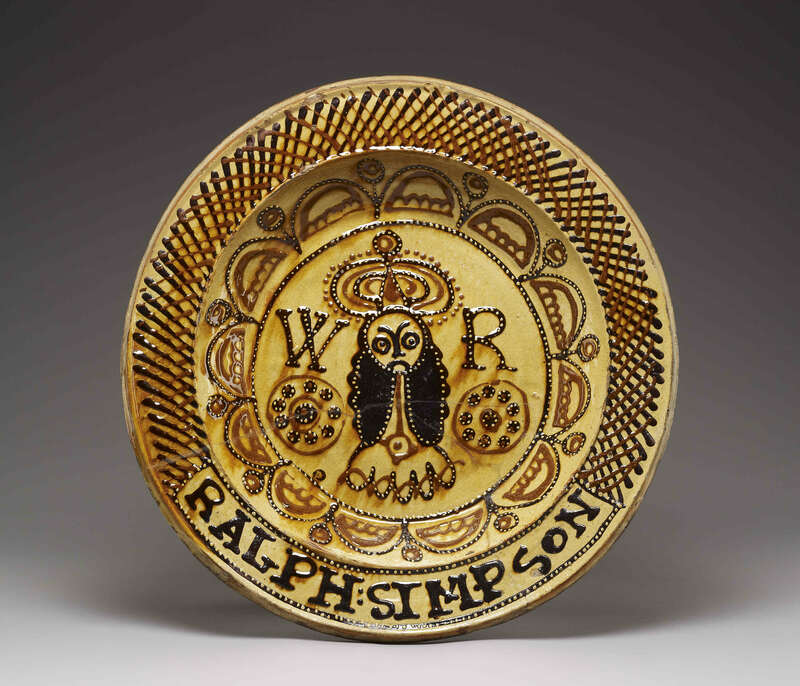 Ralph Simpson, Staffordshire, England, c. 1700. Image via www.britishmuseum.org. 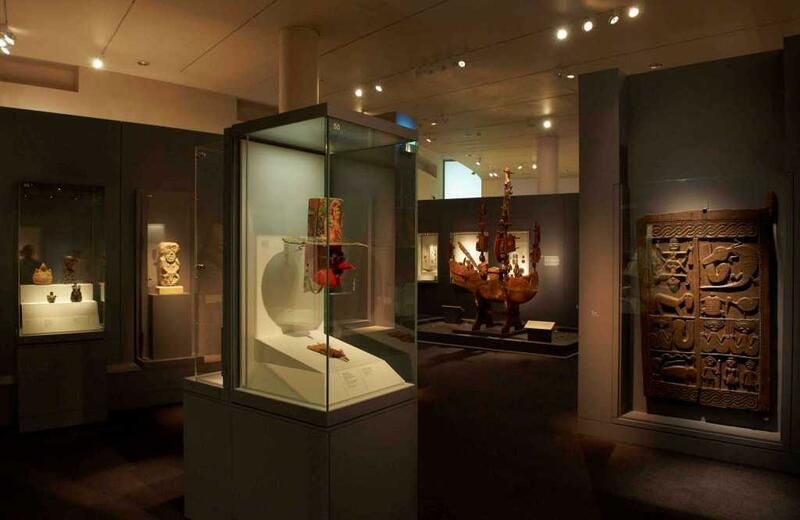 Perry’s works are displayed in the same way as the objects from the British Museum. It is not meant to be an accurate historical journey. Nor is it meant to be a representation of the museum’s collections. It is a journey through Perry’s fantasy world interlaced with relevant bits of history. 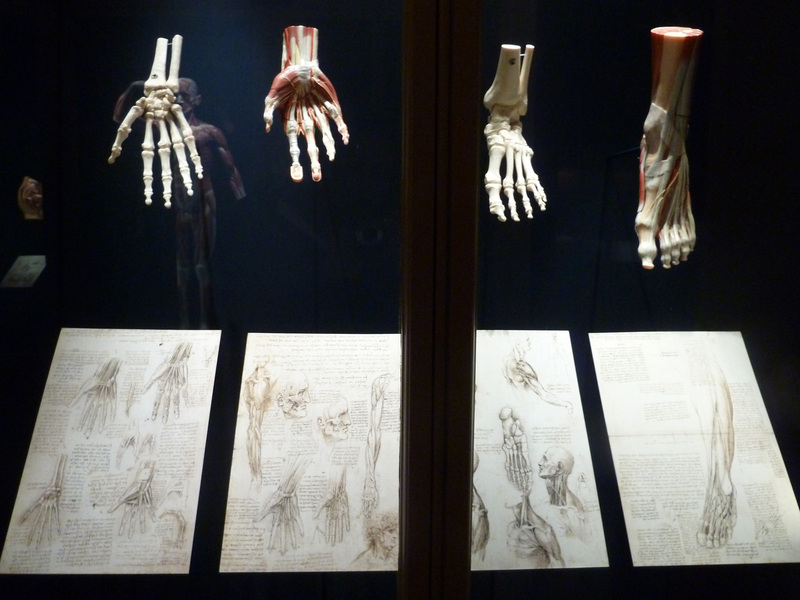 Although he may have been hubristic in wanting this show, the exhibition presents him in a very down-to-earth fashion. He isn’t pretentious, he isn’t pompous. Instead, he has humbly created a show that he wishes everyone to enjoy. 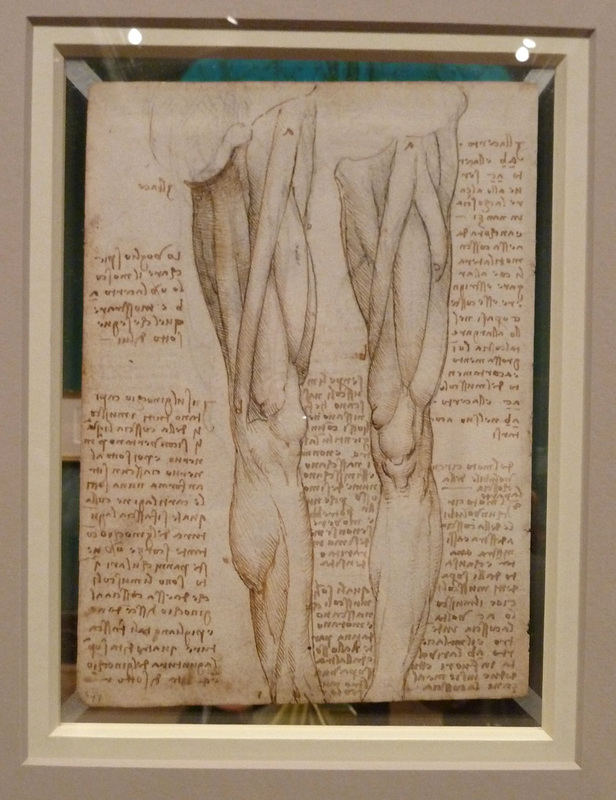 The exhibition is about looking rather than learning, contrary to what one would normally think when viewing works at the BM. But again that’s the whole point. The British Museum took a risk that they knew would pay off. Perry fans are being drawn to the exhibition and will, hopefully, fall in love with the BM and, in turn, BM fans will join the Perry cult. It’s a brave and exciting juxtaposition that won’t be seen again for a long while. 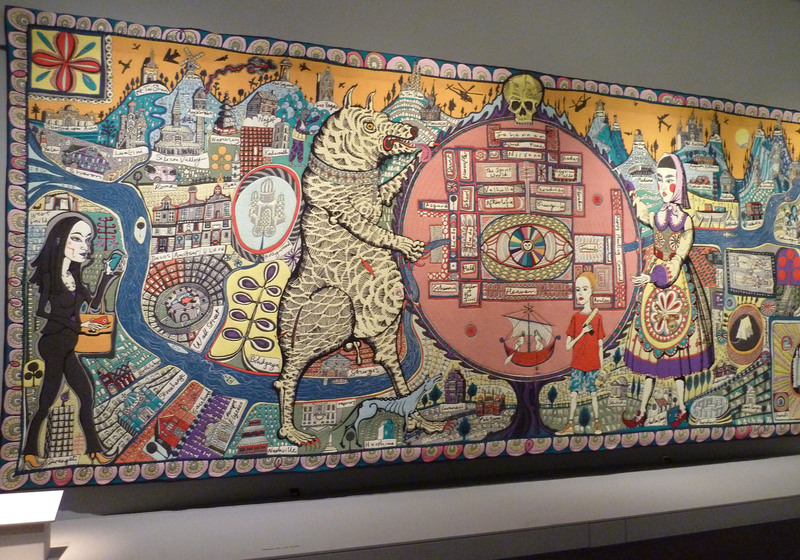 Grayson Perry, Tomb of the Unknown Craftsman, 2011. Own photograph. Tomb of the Unknown Craftsman, the exhibition’s title, is also the centrepiece of the show – a tribute by Perry to craftsmen of the past who have remained unnamed and unacknowledged. 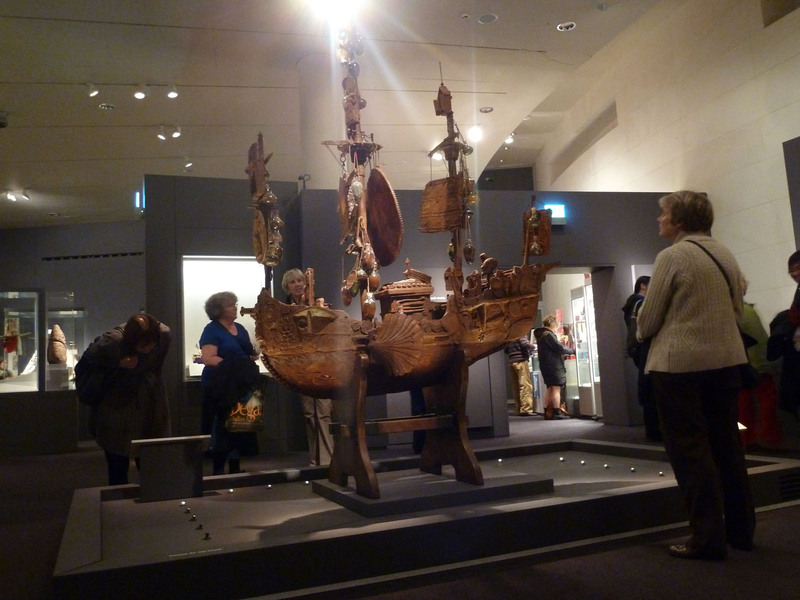 The work itself is an elaborate iron coffin in the shape of a ship, adorned with casts of museum objects, carrying a tomb at its centre in which lies a flint. 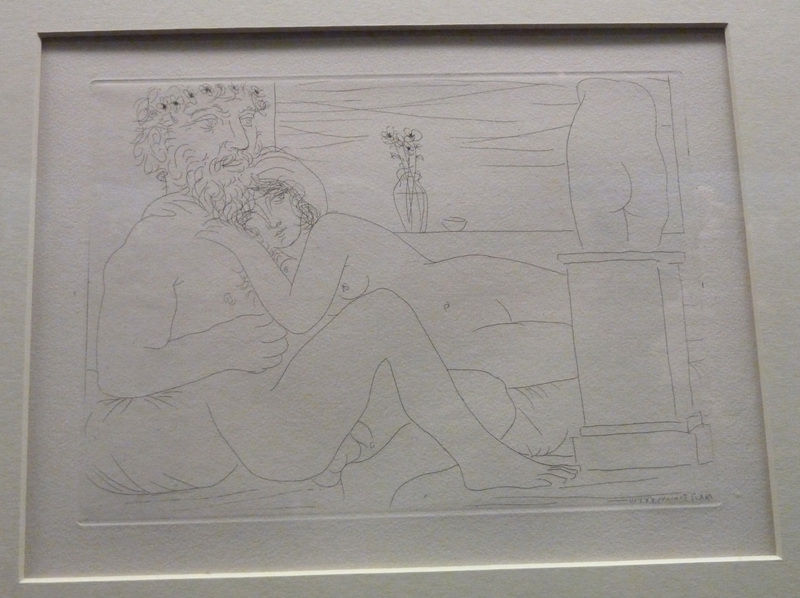 As you walk through the exhibition, you are led on a pilgrimage to this work. Perry takes great pride in the skill required for his craft and this exhibition certainly shows that off. This pays homage to all craftsmen. One of the most dazzling works, the tapestry, Map of Truths and Beliefs, shows many possible pilgrimage destinations – be they religious or secular. Grayson Perry, Map of Truths and Beliefs, 2011. Own photograph. The catalogue, too, is beautiful (although it would benefit from the addition of some academic essays that would add weight to the exhibition) and is one of the many souvenirs available from this pilgrimage. 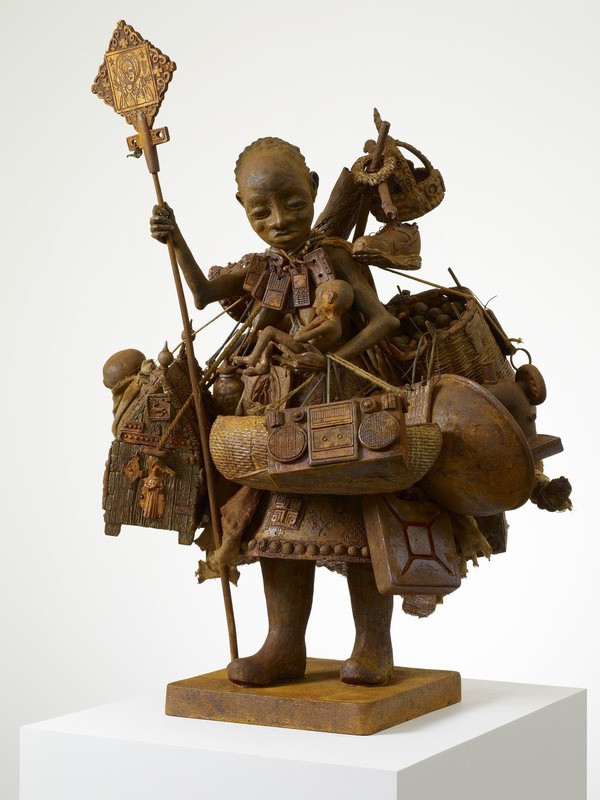 The exhibition itself includes souvenirs of pilgrimage, keepsakes to act as personal mementoes. Some are Perry’s, some are original and that is part of the fun here. Tomb of the Unknown Craftsman blurs boundaries between the historic and the contemporary. 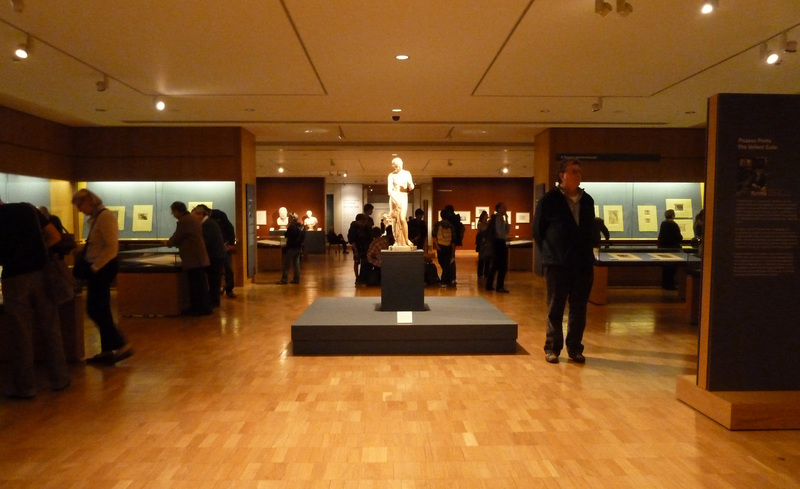 From a distance, it’s sometimes hard to distinguish Perry’s works from those in the collection. The very nature of the room 35 exhibition space means that sections of the show are too crowded, with people pushing past each other and the exhibits. But, it’s easy to ignore this as the pros far outweigh the cons. The exhibition does highlight the absence of spiritual or religious devotion in today’s artisans or craftsmen but this is much apparent in earlier work. To Perry, shrines are the embodiment of all his work. He puts meaningful artefacts in a specific place and people visit to contemplate them. In a way, this is how he sees art galleries. In this case, the shrine could be the British Museum but, otherwise, it could just be the corner of a room. This exhibition is a shrine to Perry. Although the concept was his own, the staging of the show is a nod of recognition to Perry’s genius (and to that of Neil MacGregor). 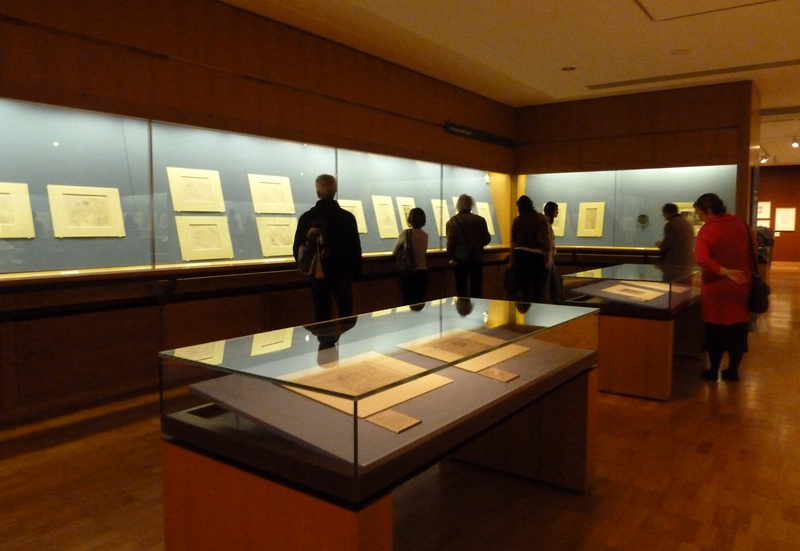 Installation shot of the exhibition. Image via www.britishmuseum.org. Grayson Perry: The Tomb of the Unknown Craftsman is at the British Museum until 19th February 2012, www.britishmuseum.org.